Franklin Hills is a small, affluent, neighborhood located within Los Feliz near Silver Lake and East Hollywood. Local landmarks include the Shakespeare Bridge. 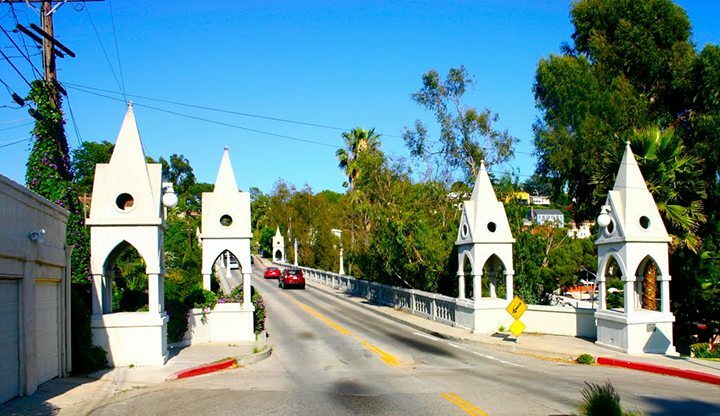 It’s a small bridge located on Franklin Avenue that was was designated a Los Angeles Historic-Cultural Monument in 1974. From the bridge you can see the Lycée International de Los Angeles. It’s a French language immersion school housed in another Los Angeles Historic-Cultural monument designed by John Lautner. Also on Franklin Ave (at the corner of Myra Ave) is the last home designed by architect Rudolph Schindler. To read more about the Franklin Hills and the surrounding neighborhoods click a link below.